We all have always believed that baking soda is for eating purpose only and it is used just for cooking. Its use is not just limited to the kitchen. Its uses vary from basic daily hygiene, injuries, digestive issues, sore throat, cough etc. Another name for sodium bicarbonate, baking soda has been used as a rising agent that helps regulate pH of the body. It has a neutralizing effect if it mixes with either acid or alkaline substance. It also has leavening properties which clearly indicates that it can cause the dough to rise by producing carbon dioxide. It treats a lot of issues and helps the body in various ways. 1. Skin Exfoliator: It is an excellent remedy for pimples, blackheads as well as acne. It helps in removing the dead skin from the skin by mildly exfoliating it. It has an antibacterial property that help prevent breakouts. You can simply remove dry skin from your face by creating your own exfoliate. All you have to do is mix one teaspoon of baking soda with a cup of water. Rub it on your face in a circular motion, and then rinse properly. You can also soak your feet in this solution and it will remove the bacteria and odors, helping to prevent toenail fungus. It softens the skin and relieves the irritation. It will help soothe itchy skin and also prevent it from skin burn. 2. Best for hair and teeth: By adding a teaspoon of baking soda to your shampoo, you can remove all the dirt, oil and residue that is left over from your hair products. You can also make toothpaste at home. Just dip it in the toothpaste and get rid of the odor from your white. You’ll get whiter teeth free of plaque. With its great properties, it will deodorize your teeth. 3. Heartburn: Also known as acid reflux, heartburn is a common problem found. It is a painful and burning sensation that can spread up into your throat. It works miraculously by neutralizing the stomach acid. All you have to do is dissolve a teaspoon of baking soda in a glass of cold water and drink the mixture slowly. Since it neutralizes the acid in tummy, it is also a perfect remedy for ulcers. 4. Deodorant: You might not know but human sweat is odorless, it’s the bacteria living in armpits or the body that breaks it and gain the smell. They convert it into acidic waste products. 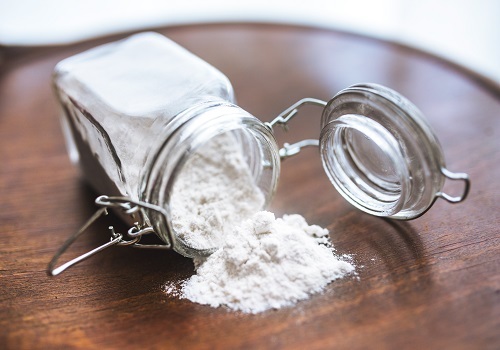 If you use baking soda, it eliminates the smell of sweat by making the odor less acidic. Pat it on your armpit and see the difference within few days. 5. Enhance Exercise Performance: Sodium Bicarbonate is a popular supplement among athletes. According to the studies, it can help you perform for longer, during anaerobic exercises like sprinting, high-intensity training etc. It has a high pH which helps in delaying fatigue, tiredness, lethargy etc, boosting the performance of the exercise. It has the power to absorb the lactic acid that ultimately builds up in the body during vigorous workouts. All you have to do is mix one teaspoon of baking soda in a glass of water and drink it. That’s all folks!!! Read it and share with your friends and family to create awareness. Stay Safe Stay Healthy.